At seventeen, music legend Dylan McAthie ran away from his Alabama home to chase his dreams. Years later, he’s forced to return—coming full circle to escape the nightmare his life has become. Hounded by paparazzi and plagued by the aftermath of personal and professional loss, Dylan craves some quiet anonymity so he can regroup and sort out what lies ahead. Hired by his estranged brother, Jennifer Adams knows exactly who Dylan is. She grew up next door to his family and has followed his career. But the surly, overbearing man she’s caring for as a private-duty nurse is far from the charming boy she remembers. Nevertheless, she’s determined to be professional, do a good job—and not fail at her first time getting away from home. As her patient heals, his demeanor softens, and their interactions grow less antagonistic. Soon their chemistry is undeniable—and inappropriate—leaving the inexperienced Jennifer thoroughly confused. Adding to the turmoil, scandal finds Dylan once again, threatening all the progress he’s made and putting Jennifer at risk as collateral damage. 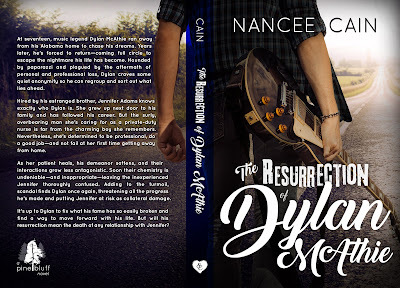 It’s up to Dylan to fix what his fame has so easily broken and find a way to move forward with his life. But will his resurrection mean the death of any relationship with Jennifer? During the day, Nancee Cain works as a nurse/counselor in the field of addiction to support her coffee and reading habit. Nights are spent writing paranormal and contemporary romances with a serrated edge. Authors are her rock stars, and she’s been known to stalk a few for an autograph, but not in a scary, Stephen King way. Her husband swears her To-Be-Read list qualifies her as a certifiable book hoarder. 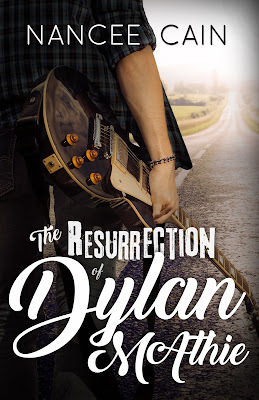 Thank you for featuring the cover of THE RESURRECTION OF DYLAN MCATHEE!